At Nor-Sea we supply high quality, versatile products that can produce a variety of dishes within the foodservice market. North Atlantic during the prime winter mackerel season. The mackerel is then filleted by hand to deliver optimal appearance and quality. Our kippers are produced from specially selected herring; caught during the summer months when the quality of North Sea herring is at its best. Modern boats are used to keep the herring under optimum conditions on its way to ports in the North East of Scotland. At Nor-Sea the raw material is hot smoked slowly over beech wood chippings. 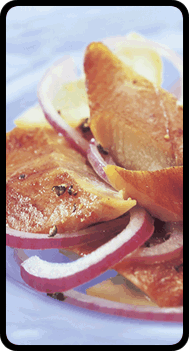 At Nor-Sea the raw material is cold smoked slowly using beech chips for a sweet smoky flavour.